“The author has worked carefully on the setting so that I really did feel as if I were a part of this rural town and I could picture the scenes as well as the people. Character interactions and the descriptions of daily life definitely ring true, and the characters seem to be very real. Fans of the cozy mystery will certainly enjoy adding Mae December to their list of charming detectives.” Read more …. 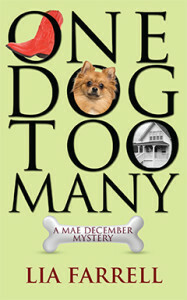 “A lively tale with plenty of twists, turns, and unexpected situations to satisfy the most ardent cozy mystery lover. The story is told in several voices, including Mae, Sheriff Ben, and Detective Wayne, with Mae’s best friend Tammy piping in occasionally, giving the tale several viewpoints of the mystery. Farrell’s additional cast of characters are fun folks to get to know, and the setting of the Tennessee countryside is charming. Animal lovers will enjoy the interaction with Mae’s kennel customers, and fans of whodunnits will love figuring out the intriguing plot as the story moves along …. A fine introduction to what promises to be an exciting series to follow.” Read more …. “The story is a combination of police procedural, rocky romance (at least two of them), and a stroll through the world of dogs. Even for readers who don’t find canines especially appealing, this novel—written by a mother/daughter pair—still has its charm. The plot is fairly straightforward, the major protagonists are believable, and the perpetrator’s motives are quite understandable.” Read more …. 5 Thumbs Up: “What a great start to a series. This debut novel contains exactly all the right ingredients needed to make a perfect cozy mystery…. Through a crisp writing style the authors bring their characters not only to life, but has them serving sweet iced tea to the reader as they progress through this book, and in this way it I found it very easy to connect with them and establish a relationship; even their gossip made me feel included in their everyday lives.” Read more …..
Mae December runs a successful dog boarding business in Tennessee. When her neighbor, Ruby Mead-Allison, fails to pick up her unruly Pomeranian from Mae’s kennel, Mae pokes around and discovers the woman’s body. It is clad in one red boot, and there is a vehicle counting cord wrapped around its neck. While delving into the mystery of Ruby’s death, Mae encounters handsome Sheriff Ben Bradley. Together they find no shortage of suspects. Ruby was standing in the way of a project that would widen the road and make the area safer. Was she killed by an angry neighbor? Her estranged husband? Her disinherited brother? The sheriff may not appreciate Mae’s amateur detecting, but he does respond to her as a woman. Meanwhile the murderer thinks it’s time to put a permanent stop to Mae’s meddling. The sheriff looked frustrated. Mae quietly added some fresh coffee to his cup and glanced enquiringly at Deputy Phelps, who shook his head. Mae turned her attention back to the sheriff. She nodded absently, still upset at recounting her discovery of Ruby’s body. “Yes, right. I went to see what she was pointing at and noticed something red at the base of one of the trees.” She stopped, overcome with nausea. “Just a minute.” Mae went to the refrigerator and took out a pitcher of fruit tea. She poured a glass and added ice. She stood and looked out her window for a moment, seeing the lush spring morning that contrasted starkly with Ruby’s demise. She took a few deep breaths to compose herself before she turned back to the sheriff.